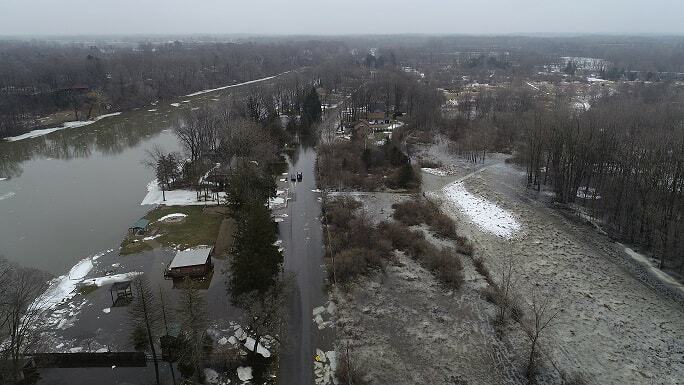 Residents along the Saint Joseph River in Royalton Township are seeing some relief as flood waters receded late on Wednesday, Feb. 6. Some slight ponding on the roadways remain, but there has been a significant reduction of water from yards and along the river. In the evening hours, ice collected along the M-139 Highway bridge broke free and allowed the river to flow more normally. “Within a few hours, residents were reporting that they saw an 8 inch drop of pooled water from the roads and from the drainage ditches in several side yards,” said Capt. Rockey Adams, the Berrien County Emergency Management Coordinator. Residents who need help recovering should call 2-1-1 for referrals to community resources and advice.